… was almost a let-down. On my way home from work, I hit 5000 bicycle miles for the year. I’m glad I did, but it does seems a little bit of a let-down. There isn’t enough time left in the year to add serious miles, just commuting and a little riding around town. I know my mileage for 2011 will be down some. I live a lot closer to work now. I’ll be spending a lot of time training for the triathlon, most of that time won’t involve the bike. I still have other goals to work for. I want to complete the triathlon in 2011. 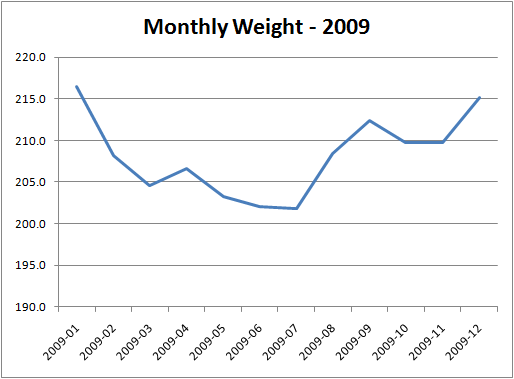 I intend to reach my goal weight in 2011 (about time, I started all this in 2007). … is re-branding themselves as “The Y”. Why? I don’t know. How do I know? I was at the downtown location today becoming a member. Why am I becoming a member? Well, I will write more about that later. I have a new goal, a new obsession, and a good way to lose weight and get more fit. I will tell you why I’m doing what I’m doing, even if I’m not telling you what I’m doing, yet…. Confused yet? I was involved in an online discussion about the “fat person mentality” that tends to hang around people like me, even after shedding the pounds. It becomes an excuse to not do things. You tell yourself “I can’t do that, I’m just a fat guy”. The name of this blog really shows the issue. Yes, I was a fat guy when I started it, but am I still? Even if I am a little, is it enough to prevent me from doing things anymore? No. It’s not. I can do anything that any other normal person can do. So, I’m taking a challenge. I’m going to push myself. The Y membership will help me. Back in October I ranted a little about my lack of control on my eating habits. I made a brief effort at the time, and now, a month later, I’m back in the same rut. I haven’t been cooking. I go out to eat almost every day. I’ve been drinking beer several times a week. I’ve been snacking. The only exercise I’ve been doing is bicycling. I haven’t stepped on a scale in a while. That’s changing now. I will drink NO beer until further notice. I will cook and prepare lunches to take to work. I will not go to the coffee shop, unless it’s to buy more whole bean coffee or to buy a cup of coffee on a bike ride. I realized earlier today that I would have ordered pizza today for Thanksgiving had I found a place open. As I got hungrier, I cooked what I had here at the house. 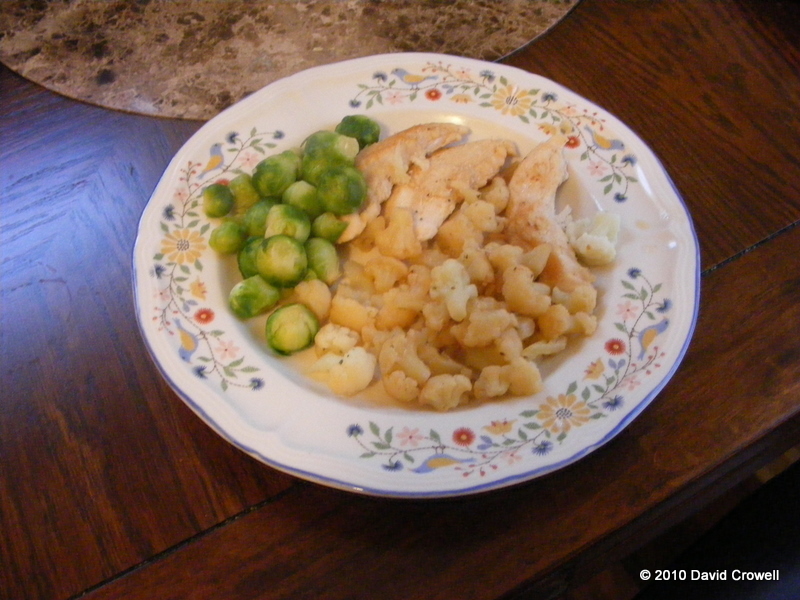 I hadn’t went grocery shopping in a while, but I had pork chops, frozen vegetables, and a couple of potatoes that I made into mashed potatoes. I had hoped to be under 200lbs by the end of the year. I now know that’s not going to happen. My revised goal is to be under 210lbs by the end of the year. It’s going to mean a difficult push to even do that. 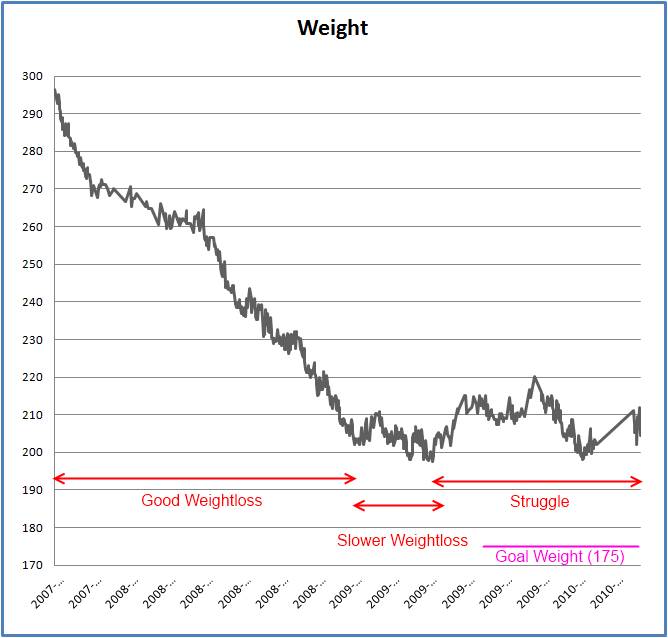 I’ll get back on the scale tomorrow morning, then update my daily weigh-in page. On Thursday I had some candy at work. One of the departments was doing a trick-or-treat thing. I ate a small amount of candy and left it at that. I worked from home on Friday (due to a health issue). Later in the day I went grocery shopping, and bought several large bags of candy for the kids that will expect some. I made it a goal to not eat any of this candy, no matter how much is left. I’ll take the leftovers to work. So far, so good. Today, I shirked a bunch of responsibilities and drove out to Bluegrass Bicycle for the LBC Crestwood ride that Tom was leading. Actually, as ride captain, he had to trail behind everyone else. I’ve ridden that ride before. It’s roughly 25 miles of rolling hills in the Kentucky countryside. I decided to ride my single speed bike. I wasn’t really even sure if I could finish the ride on that bike. I did fine. I walked two hills. I averaged 14.2 mph. I was near the rear of the ride, but not completely at the end. I did feel like I was going to cough up a lung a few times. I think that’s a good route to get faster on a single speed. It’s hilly enough to be challenging, but not so long or hilly to be impossible. My weight has dropped back to about 216 after peaking above 220. I need to keep the momentum going. I’m 41 lbs from my goal. I let it slip away before. I don’t want to do that again. In my previous post I mention that I’ve been “out of control”. That’s true. I’m fixing that. 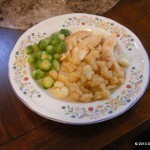 Cooking meals at home is saving me money and helping me eat healthier. Bringing coffee to work saves me money and keeps me from being as tempted by the snacks at the coffee shop. Taking a lunch to work is saving money and calories over eating out. I may, or may not, ride another LBC ride tomorrow. I have a lot of things to do, but I would like to get some more riding in. I haven’t been under control recently. I eat too much. I spend too much. I eat the wrong things. I’ve gotten out of the habit of cooking. I’ve gotten into the habit of stopping at restaurants and coffee shops way too often. I’ve gained weight. My weight this morning was 221.2. I’ve erased a lot of progress, but that’s changing today. I haven’t spent a penny today. I brought a lunch to work. I carried a thermos of coffee to work. I cooked dinner tonight. I have leftovers for tomorrow’s lunch. I want to be at my goal weight of 175 (less than 50 lbs away) in one year. Then I want to maintain between 170 and 180 indefinitely. In addition to controlling myself again, I’m going to start doing some upper-body exercises. I have a set of dumbbells, but haven’t touched them in a while. I need to quit busying myself with stupid stuff. I can exercise all I need in a few minutes a day. I’ve been riding a lot of miles. I broke a few records on Sunday. I’ve ridden two centuries in a little over a month. I hit 3000 miles of cycling for the year during my commute today. I’m well on track to get 5000+ miles for the year. The depression that was really affecting me earlier this year has gone away. I’m sure it’ll come back again some day, and I’ll have to cope. Overall, I’ve been feeling really good recently. My eating has been crazy. It’s partially from being hungry from riding. It’s partially due to treating myself to beer, pizza, ice cream, steak, and similiar items much too often. I haven’t had any real weight loss since March of 2009! That sickens me. I know weight is just a number, but I still have a gut. I feel like I’m way too fit for this gut. I’ve got to lose the gut. Damn the gut! I’m having comfort issues on my newest bike, Surly Sue, the LHT. Although I’ve ridden two 100-miles rides on that bike, the recent rides have left me with possible ulnar nerve issues in my left hand. I also have some saddle issues to figure out. As such, I’m riding Oria, my recumbent, more often, as there is no pressure on the hands. I will get a bike fit to help get comfortable again, but in the meantime it’s nice to have another option. I’m trying to get my eating under control. I had started my “food diary” back up a while ago, but that didn’t last long. I need to track what I eat. I’ve decided that I need a fast bike. 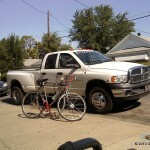 Both my current bikes are designed to be comfortable for hauling stuff long distances. Neither is really designed to be fast. After much thought, I think my fast bike will be a recumbent. Probably a Bacchetta Strada. It won’t be until at least next year until I can afford one, but that’s the plan. Last Saturday I rode a Century. I rode my bike to work and back 4 out of five days this week (I overslept on Thursday). Most days this week were calling for rain, but I avoided it each time, other than a few sprinkles. My commuting for the week racked up 140.5 miles on the bike. I’m not doing any big rides this weekend. I may not ride at all. I have a lot of “domestic” stuff to do. I’ve had a depression issue for most of this year. It lifted mysteriously on Thursday, May 27th. I’ve been almost giddy ever since until yesterday (the day I didn’t ride) and my mood darkened. I rode again today, and things are well again. Does riding fix the depression? Is the cause more subtle than that? I don’t know. I do know that it’s hard to get on the bike when I’m depressed. I’ve been eating better, other than Wednesday where I went out for lunch, and again for dinner. I overate to the point of discomfort at dinner. I hate it when that happens. My weight is still bobbing around between 200 and 210. It may linger there forever, but I now know that I must monitor my weight regularly and watch what I eat for the rest of my life. This isn’t negotiable. If I fail to do this, I will gain every pound back. My goal weight is still 175. It may take a long time to get there. It seemed to be in striking distance at one point, but the loss has stalled. That’s not the way I did things. I started with the diet, then exercise, now I’m hoping to lose more weight, but trying not to gain more. When I started this adventure my BMI was about 41. Standard medical procedure for someone like me would have been gastric bypass. I’m glad I didn’t go that route. I rather like having a complete GI tract. My BMI is now about 28, which is still considered overweight, but I would no longer be considered for surgery, and that is a very good thing. I got a bit lazy after losing 100lbs. I started to indulge in the foods I love. I thought I could still do it, because I’d already lost weight, and because I ride my bike… a lot! Well, that’s not the case. I went two months without weighing myself and gained almost 10 lbs. I’m back to keeping a food diary. I am weighing myself daily again. I’m making more appropriate decisions about what I eat and drink. I may have to give up beer. It’s a weakness for me, and I often go to a wonderful food establishment just for the beer. Then, of course, I partake of the food also. I really wanted to go again today. I didn’t. I stayed home and ate sensibly. If that particular establishment is off-limits to me, and I quit drinking beer, it would be easier to stay on track. I’m at my gate at Dulles Airport. I’ll be home this afternoon. I’ve made a concerted effort for most of my trip to keep my eating under control. That didn’t stop me from enjoying some great food, but I tried not to overdo it. I’ve also been staying away from beer, at least since Friday. I did get to visit two museums on this trip. First was the National Museum of the American Indian. 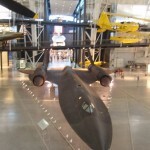 Although an enjoyable experience, it doesn’t compare to National Air and Space Museum – Steven F. Udvar-Hazy Center. I do have new resolve to lose weight. I don’t want to be “The Fat Guy” any longer. 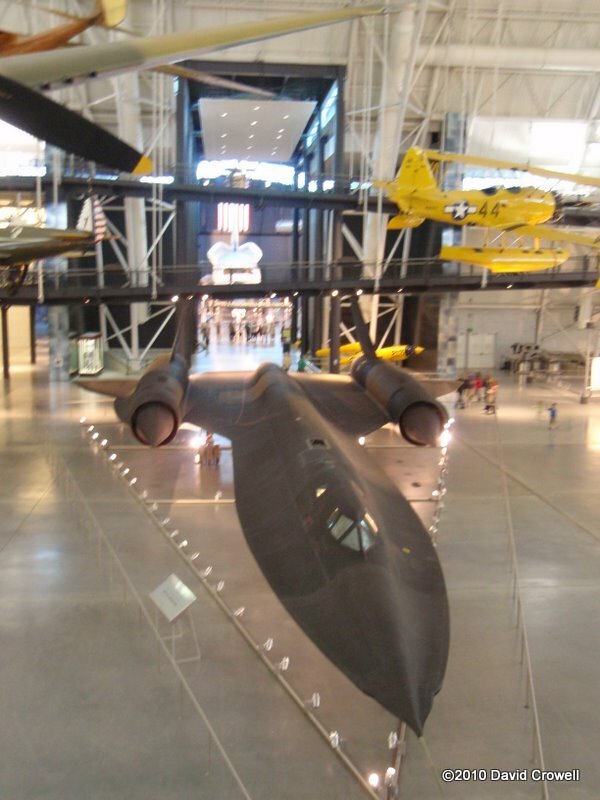 I’ll leave you with a picture of an SR-71 Blackbird, one of my favorite aircraft. Weight is just a number. The number means something different to everyone. I’ve been fixated on two numbers. 200 and 175. 175 lbs is my goal weight. 200 is the barrier that I’ve been trying hard to get below and stay below. So far I have failed both of these numbers. What do I owe to these numbers? Why do I obsess over them? Numbers are hard facts, even if they aren’t the right facts. I haven’t weighed myself since April 1st. I’ve been trying not to obsess. I have been overeating, and have probably gained a little weight. I’ve also been putting quite a few miles on the bike. Maybe it will balance out, maybe not. I will start weighing myself again, but not yet. Maybe in June. It’s been months since I’ve posted a weekly update. 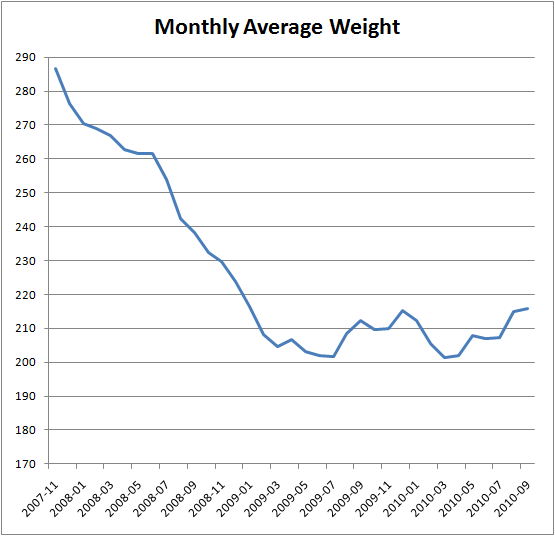 My weight loss had stalled, so I mostly wrote about bicycle related activities. That has changed. I’m losing weight again. My new diet is working. I still expect to reach my goal weight of 175 lbs. I hope to reach it before the end of this year. My new diet should make it easier to maintain than my previous low-calories diet. After re-reading my previous post about the year in review, I realize the problem. I started a true lifestyle change back in 2007. The changes were drastic, but effective. I lost weight, and got much more fit. The changes centered around eating sensibly and getting exercise. I realize that although I’m still much healthier and fit than I was when I started, my eating habits have slipped gradually back to horrible. Overall, I’m still doing well due to the exercise I get but I need another lifestyle change. I’m considering a six-day diet. A strict low-carb diet six days per week, then eat what I want on the seventh. This will allow me to lose weight, yet still go out with Kristy for dinner, or have a beer or three. The low-carb, high-fat, high-protein diet is a bit controversial, but will be easier to fit-in with Kristy’s cooking habits. It’s also similar to what I was eating during my best period of weight loss. I still need to track everything I eat, and weigh regularly. Both of those things mostly disappeared for the month of December. What a wonderful/busy/crazy/happy/stressful year it’s been. I (mostly) lost weight through the first half of the year, but mostly gained it all back in the last half. I’m still happier with my weight than I was in 2007 or 2008 though. I need to have the self-control that I did in 2008 again. I didn’t make my goal of 5000 miles. I knew I wouldn’t fairly early. I did ride 3,860 miles for the year, which beats the previous year of 2,238. Rode 91.6 miles – holy crap! what happened here? I’m happy with what I’ve done for the year. I met a wonderful woman, fell in love, and got married. Looking back at my posts from the past year, many of them seem rather negative. I guess it’s easy to focus on the times when things aren’t going as planned. Things usually don’t go as planned, but work out alright anyway. That doesn’t mean I give myself a pass on not losing the weight and keeping it off. I very much intend to achieve my goal weight of 175 lbs, and stay there. I’m hoping I can do it before December of next year. I re-read a previous post “Shifted Priorities“, and realize I was in the middle of a mistake at the time. I had talked about the fact that I ride for fun rather than weight loss. I was dreaming of buying a new bike, though I have two perfectly usable ones. Since then, my mileage is way down, and my weight is up. I can make excuses about being busy, but the truth is that I haven’t been trying hard enough recently. I do spend a lot of time thinking about bikes. I spend more time thinking about bikes than riding them. I have spent very little time thinking about my eating habits recently. I haven’t been tracking my calorie consumption or my weight very regularly. This has led to a 20 lb weight gain over the last five months. So, I lost 100 lbs, but gained 20 of it back. That is frustrating. I feel like the “Fat Guy” that I used to be. I did ride to work yesterday. 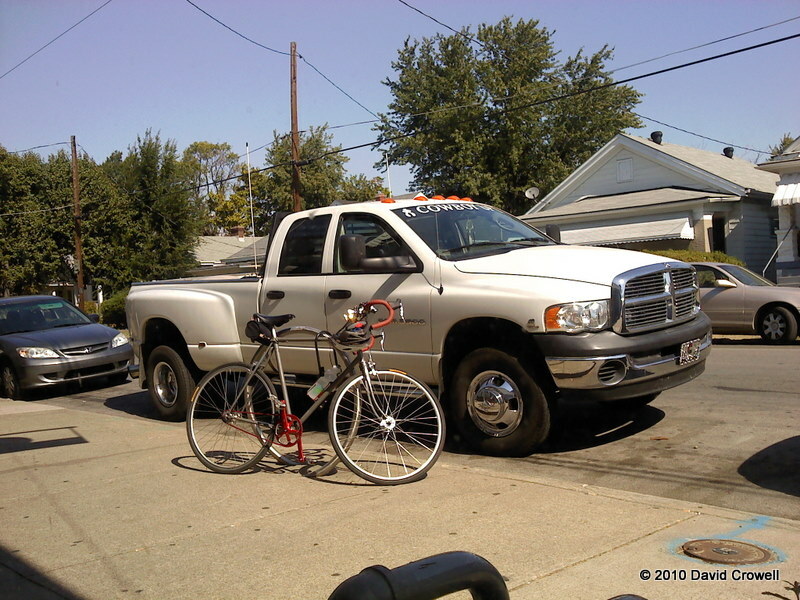 Then I ran some errands around Clarksville Indiana by bike. I traveled Eastern, Lewis & Clark, Greentree, and Veteran’s Parkway. I have never considered riding those non-bike-friendly-roads until yesterday, but it wasn’t as bad as I imagined (even with holiday shopping traffic), and I had a good time. My ride terminated at Feeder’s Supply where I bought 50 lbs of pet supplies, and waited for my wife to pick me up in the truck. I had 32 miles for the day, not bad for simple utility cycling. Ride more, eat less! I need to start carrying around paper and pen to write down everything I eat. I normally track it on my computer, but if I’m not near a computer, it may not get recorded. I need to track it even I don’t have time to calculate the calories. I need to hold myself accountable. I need to post here more often. Writing about my weight loss attempt keeps me focused. It keeps my goals at the front of my consciousness. Merry Christmas everyone! I’ll try to keep my snacking on sweets to a minimum. I announced back in February that I was going to participate in The Ride to Conquer Cancer. It’s a 150-mile two-day bike ride from Louisville to Lexington and back. The ride is this weekend. I’m behind on the fund raising. My goal is $3200, but the minimum is $2500. I have raised just over $1700 so far, so I really need some more donations in the next few days. If you can donate something, please do! This is a great cause that will help cancer patients in the community. Chances are, cancer has affected someone you care about. That certainly is the case with me. Please donate now. The deadline for mailed-in donations has already passed. Please donate online, or see me personally for donations in cash or check.